The Amazing EBow :: FAQ - How do I write the name "EBow"? Any way you like. We prefer EBow or ebow, though a lot of you like to throw a hyphen in there. 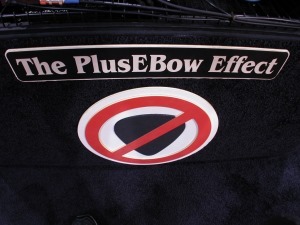 While we're at it, the correct model name for the current EBow is the PlusEBow (not the EBow Plus). It's "The PlusEBow Effect" (say it fast). We are unapologetic for this pun.